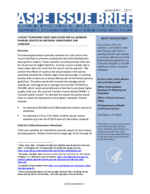 This brief describes the effects of an alternative policy that would expand child care by providing subsidies for children ages three and younger in working families with incomes at or below 200 percent of the federal poverty guidelines. The alternative policy would also increase the average annual subsidy per child age three or younger from $5,562 (FY2013) to $10,000, permitting families to purchase higher quality child care. We assumed a participation rate of 45 percent (up from 15 percent in 2012). We used the Transfer Income Model (TRIM)—a microsimulation model—to estimate the impact this policy would have on maternal employment and program caseloads. Results showed: 1) An estimated 262,000 to 427,000 additional mothers would be employed; 2) An estimated 2.32 to 2.55 million children would receive subsidies (up from the FY2013 level of 1.44 million children).